This year marks the 65th anniversary of the establishment of a China-UK diplomatic relationship at the level of chargé d’affaires. The past 65 years have not been all plain sailing: when there was mutual respect and equality, the bilateral relationship leapt forward. Otherwise, the relationship has had to battle against strong headwinds, or even back-pedal. 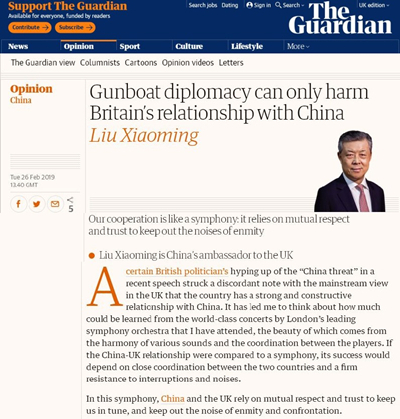 In an age when hot and cold wars should be long gone, resurrecting the cold war and gunboat diplomacy from the grave, as this politician did, was anachronistic and risks disrupting the progress of China-UK relations. Both countries must resist this disruption and keep the larger picture in mind. To do that, they need to view each other’s development as an opportunity rather than a challenge, still less a threat. In particular, we should respect each other’s sovereignty, territorial integrity, core interests and major concerns; we should build mutual trust, expand strategic consensus and handle differences properly so as to ensure that the China-UK relationship develops in the right direction. In the symphony of these relations, mutual benefit, not the pursuit of a zero-sum game, creates consonance. China-UK cooperation has never been deeper and more extensive, and the interests of the two countries have never been more intertwined. This is not only reflected by the £11bn contracts signed during Prime Minister Theresa May’s visit to China early last year and the first China International Import Expo. It is also reinforced by the fact that China is the fastest-growing market for UK exports and UK’s second largest trading partner outside the EU. Last year, our bilateral trade totalled more than $80bn and UK exports to China increased by 6.9%, much higher than its GDP growth rate. Chinese investment in the UK tops $20bn now and maintains a robust growth momentum, with Chinese companies having invested more over the past five years than the previous 30 years. The bond between the Chinese and British people has never been closer. With the opening of seven new direct flight routes between London and Chinese cities last year, the total number of flights linking the two countries increased to 168 a week, facilitating 1.5m mutual visits every year. Going forward, deeper reform and further opening up in China will create more opportunities for China-UK cooperation, including the second Belt and Road Forum for International Cooperation and the second China International Import Expo to be held in China this year. An open, innovative and inclusive UK is an internationally recognised brand name, and I hope that it will continue to provide a fair, transparent and non-discriminatory business environment for Chinese companies, including Huawei. This will win more respect, trust and cheers for a global Britain.